There are many peafowl varieties which are not available within the UK. USA lead the way in the world in developing new colours of peafowl. The United Peafowl Association as a result recognises 225 different varieties of peafowl. This chart was created by Backyard Chickens and it shows the differences in the peafowl breeds. 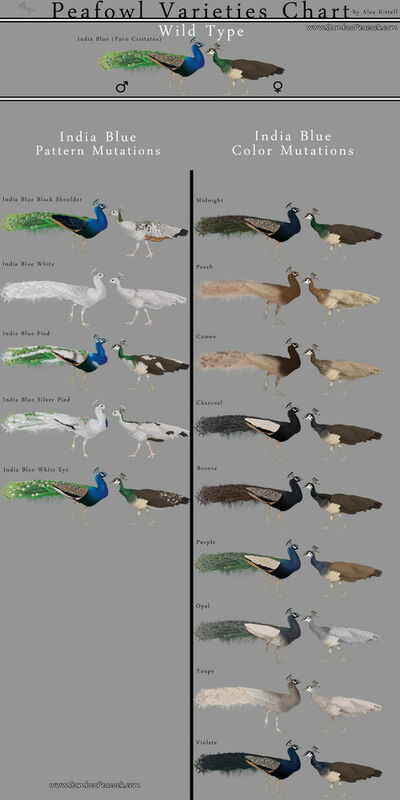 The Peafowl varieties chart clearly shows the difference between pattern mutations such as Black Shouldered, Pied and White Eyed. And colour mutations like Peach, Bronze, Purple and Charcoal. Some of these peafowl varieties such as Peach, Charcoal and Violette are not yet available within the UK. In 2011 Peacocks UK introduced other peafwol varieties such as Bronze, Opal, Purple, Silver Pied and Cameo to the UK. Since then we have been working hard to create an ethical sustainable commercial breeding programme for these beautiful rare breeds. Developing the breeding programme for the rare breeds has been rewarding, watching the first purple and Silver Pied chicks within the UK hatch was wonderful. At this point we have created a sustainable breeding programme for Opal Peafowl, Burford Bronze Peafowl, Cameo Peafowl and Silver Pied Peafowl. In 2016 we were delighted to hatch three Burford Bronze male peachicks, we have struggled with the Burford Bronze breeding programme. These Peacocks will form the basis of our Burford Bronze Breeding program. The Burford Bronze Peacocks have been bred with Indian Blue Peahens creating Burford Bronze split to Indian Blue Peacocks. We will mate the Burford Bronze split Indian Blue peacocks with Burford Bronze Peahens. Keeping the blood lines strong and preventing inbreeding. This is particularly important as there are so few Burford Bronze Peafowl currently within the UK. Other peafowl varieties such as Opal and Silver Pied have been more successful and we currently have both Opal Peafowl and Silver Pied Peafowl available for sale in the UK. It still feels like a huge privilege to be breeding these very rare peafowl varieties. We recently sold the first pair of Silver Pied to go on view publicly to Little Owl Farm in Worcestershire.